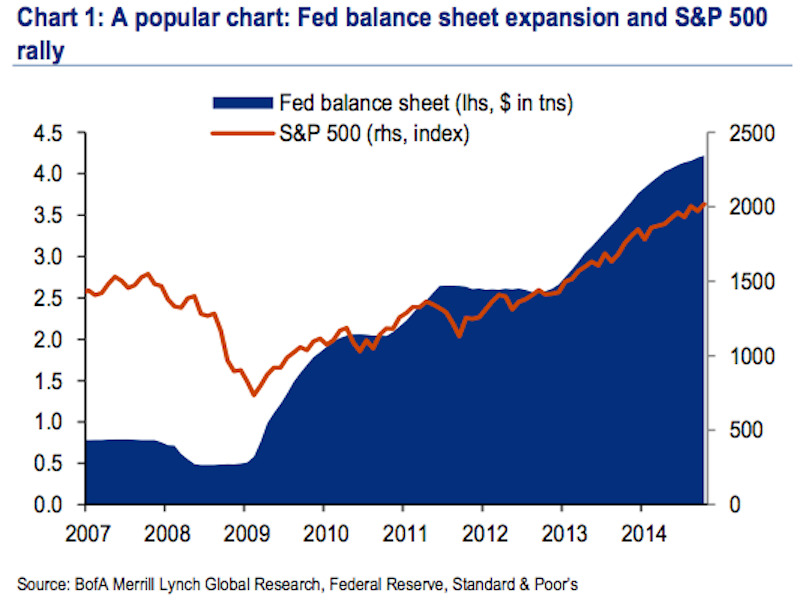 Is the Federal Reserve’s quantitative easing program responsible for stock market gains? The ‘Yes’ camp maintains that the easy money being pumped into the economy (via quantitative easing) by the Federal Reserve flowed not into the real economy but financial markets, inflating the price of stocks, bonds, and other financial assets. The ‘No’ camp says that a recovering US economy and steady earnings growth has powered the market higher. The main target of Harris’ critique is the above chart, which has been a favourite among the “QE-truthers,” or folks who believe the Fed’s policies are directly responsible for the stock market’s rise. But the big problem Harris has with this chart is, well, basic statistics. “Implicitly, this chart assumes that the markets are not forward looking and it is the implementation of Q that drives the stock market: when the Fed buys, the market booms and when it stops, the market swoons,” Harris wrote. Harris also walks through a number of the narratives that have shifted over the last few years, pointing out, among other theories, the idea that the Fed ending its QE program could have caused a selloff in bonds in 2013, but a rally in 2014. “Boy is ending QE powerful,” Harris wrote. In our latest Most Important Charts feature, Greenlight Capital’s David Einhorn highlighted the trouble with correlations, pointing out that the “any two lines” school of charting and financial argument can be not just highly — but ridiculously — flawed. Here are two facts: the size of the Fed’s balance sheet has risen in the last five years; the stock market has risen in value over the last five years. That one of these caused the other is less clear.